I have actually wrote this product review during my trip, but I just didn’t have time to post it. I have been very busy at work since I came back from my trip to Europe, so now I am uploading it for you here! So I bought this for my trip because I needed some mask to keep my skin in good shape since the weather there is very dry. So the first time I used it in my hotel in Strasbourg, the weather there was so cold and dry. After a day of sightseeing I can feel my face became red because of the strong wind! So I took out this mask on the first night there and apply it right after I came out of shower! I like the cream texture because this is going to moisturize your skin better, I need a thick cream to wrap my skin and to calm it down after a day spent under the wind. I am always a fan of rose, well…. actually all kinds of flowers! So first of all I have to say it smells good! I love the smell of rose and you can tell it is very natural, not the artificial ones. 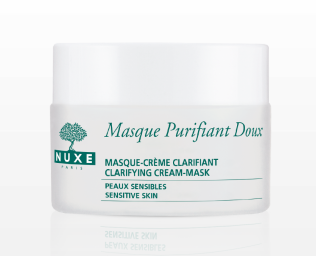 This mask should be applied to your face and neck – neck! Never forget to look after your neck because this is where ladies shows their signs of ageing! So I applied it all over my face and neck, and during that 20 mins I heated up some water and soaked a washcloth and gave myself a little steam treatment! When the time is up, it has only very little residue left on my face only a tiny amount near my hairline, that’s all. The result – It is very calming and my face is glowing! I think part of it because I gave it a little extra kick by steaming my face with a warm washcloth! It’s calming and my face is glowing! But I am not sure how exactly does it purifies the skin. I used the Nuxe rose petal toner from the same line to tissue it off. I am quite a fan of Nuxe and this rose petal line! Have you girls try this line of product before? Please share with me!